Advanced Digital Design Practices and especially Digital Fabrication initiatives are highly experimental, often expensive, prone to risks and idiosyncratic in the procedures adopted. These characteristics render as difficult the implementation of controlled procedures as the very collaboration between practitioners and researchers, such as for example by having access to their data and observe their procedures. In fact, despite the strong influence of the opensource culture on many digital architectural manufacturing initiatives, the consistency of procedures or data conservation, accessibility and reuse are often secondary with respect to the physical manifestation of the manufactured product. Though, the adoption of Information Management attentions for Digital Manufacturing are especially important because of key aspects of the CNC production such as processes repetition and data reuse across contexts and machines. What specific difficulties and drawbacks are especially evident in the longterm management of Digital Fabrication data assets? 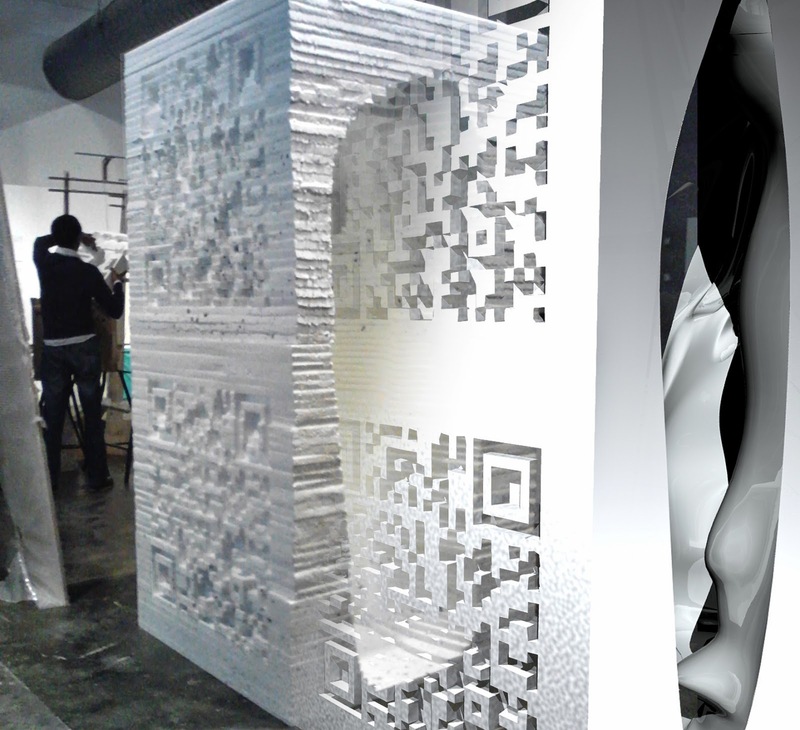 Installation of the HWFG pavilion and superimposed render of the entire structure. I addressed the assessment of the workflows adopted in Digital Fabrication within a collaboration with the Master of Research in Creative Practices of the Glasgow School of Art which took place through assisting a Master student, Gaetano Chianese, in the realisation of his final work. This project resulted an eight cubic meter pavilion composed of EPS sheets shaped with a large format CNC router. For the fabrication of the pavilion, 168 EPS70 sheets (2400 x 1200 x 25 mm) were cut and assembled in modules with vinyl glue in approximately 2 weeks at the MAKLab. This pavilion gathers together text and performative actions in a reclusive physical environment assigning its visitors both the spectator and active character roles in a play entitled 'Hamlet Waiting for Godot' (HWFG). The QR codes on the surfaces of the pavilion link to multimedia contents hosted on a dedicated website. 'HWFG' is an installation on exhibit from the 14th to 28th September at the Lighthouse, Glasgow City Centre. Don't miss it if you are in Glasgow!